Nothing adds appeal to the outside of your home like a new coat of paint. It also safeguards your investment by protecting wood siding and trim from water damage...and gutters and downspouts from corrosion. Spring is the ideal time to tackle a painting project. But before you get started, let's review some points that will help ensure your success. First, properly prepare the surfaces to be painted. A little extra time here will pay off in a better looking, longer lasting paint job. The siding must be clean and free of flaking old paint for new paint to adhere properly. The quickest, easiest way to make sure it's ready for painting? We rent professional power washers that deliver up to 2,000 lbs. of water pressure per square inch to blast away loose, flaking paint. Grease and grime can also be removed when a strong detergent and chlorine bleach are mixed with the water. A good power washer can eliminate most scraping. Stubborn spots may require special attention, however. For those, I recommend one of our electric heat guns. Hold the gun about one inch from the paint and keep it in motion to avoid scorching the wood. The heat from the gun will make the paint soft and blister for easy removal with a putty knife. A wire brush attachment on an electric drill will remove rust and corrosion from gutters, downspouts and wrought iron railings. Wear goggles and gloves for protection against flying paint chips. 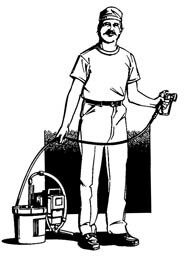 Airless sprayers can save a lot of time—an important advantage for weekend painters. The sprayers propel paint at high pressure to evenly cover rough or irregular surfaces. How many gallons of paint will you need if painting by brush? Determine the area to be painted by multiplying the average height of your house (from the foundation to the eaves) by the perimeter. Then divide that number by 500—the average number of sq. fet. covered by a gallon of paint. Airless sprayers generally require more paint. An older house in good condition may only need a single coat of paint for good coverage. If you're painting a new home, you may need a coat of primer and two finish coats. As a rule of thumb, you'll need one gallon of trim paint for every six gallons of paint you apply to the siding. To apply paint on lap siding, paint the underside of each board first. Avoid overloading the brush to prevent paint from running down the brush's handle. Then paint the siding in short strokes across each board. That will smooth any drips from the underside. Press the brush bristles against cracks and rough areas to force in the paint. For painting with a sprayer, use a flexible extension tip to paint the underside. Then paint the rest of the siding with strokes that maintain a 12-ince distance to the wall. A word about ladder safety. Never allow an aluminum or wet wooden ladder to come near electrical wires. And never set a ladder in front of a closed, unlocked door. Someone may open it and knock over the ladder. Scaffolding can be more convenient than a ladder for painting areas above the first floor because it allows greater horizontal movement. We can provide the ladder or scaffolding that's best for your needs. See us before you get started and we'll help supply everything you need—except the paint.